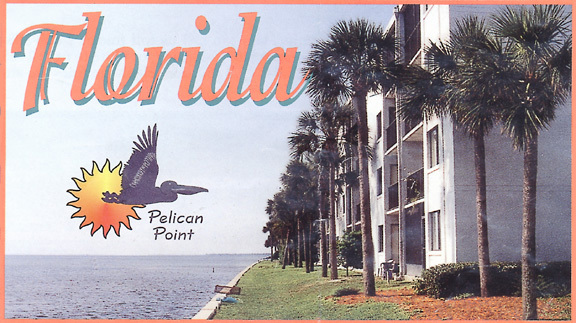 All Pelican Point condominiums are two bedroom, two bathroom units with private balconies. Each unit features a modern kitchen complete with frost-free refrigerator with ice maker, oven/range, disposal and dishwasher. The main bathroom has a tiled shower stall. The design of each unit allows for flow-through ventilation from the nearly constant sea breezes. The spacious balcony is accessible from sliding doors off either the living room or the master bedroom. Each unit at Pelican Point features well over 900 square feet of living area including the balcony, which, considering the magnificent views, will become one of the most popular rooms in the house! All units have quality wall-to-wall carpeting, vinyl in the kitchen and bathrooms, and indoor/outdoor carpeting on the balcony. 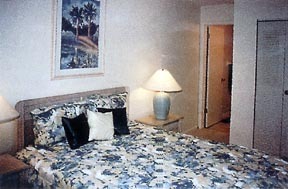 Each suite has its own central air conditioning unit and water heater. The units are accessed via exterior hallways. At the midpoint of each hallway are the elevator lobby, and a laundry facility, with 2 coin-operated washers and 2 dryers per floor. 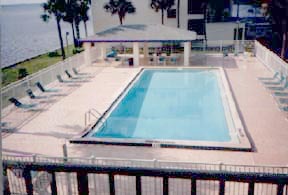 Property amenities include a lighted tennis court, a large heated swimming pool with 100 palm trees, plus various tropical flowers and shrubs. There are ample parking spaces outside each building, including an area for boat and RV parking. 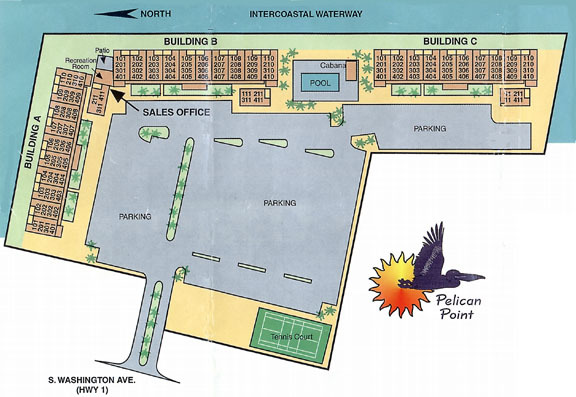 Pelican Point consists of three buildings of four stories each, and every building is serviced by an elevator. Because the property extends out into the Intercoastal Waterway, all of the buildings are built facing the water. Virtually every unit has a magnificent and unobstructed water view, looking either north along the Intercoastal, or east towards Cape Canaveral and Merritt Island. 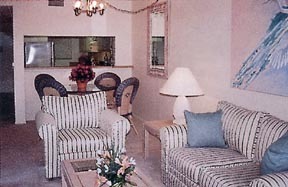 Four units have views overlooking the 52 foot heated swimming pool. 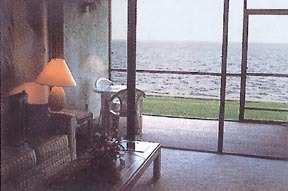 Pelican Point was built in 1985 entirely of concrete, ensuring the maximum in durability, privacy, and sound-proofing. All three buildings have recently been re-roofed, the parking lot resurfaced, and the exterior as well as the interiors of the buildings have been repainted.